Why Is the U.S. Wary of a Declaration to End the Korean War? 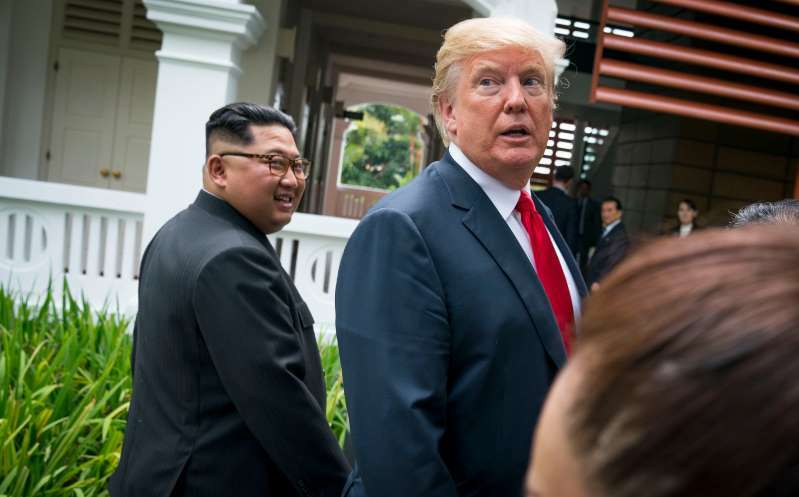 President Trump and the North Korean leader, Kim Jong-un, in Singapore in June. The two sides have clashed over just what their agreement at the summit meeting means. No doubt the issue will be high on the agenda when the leaders of the two Koreas hold their third summit meeting next month, in Pyongyang. Both want the end of the war to be declared this year with the United States and, possibly, China. And North Korea insists on securing the declaration before moving forward with denuclearization. But there is a range of reasons American officials have refused so far to embrace a formal peace declaration. The Trump administration wants North Korea to first halt its nuclear weapons program — a tough line that could create a divergence between the United States and South Korea, its ally. [post_ads]In turn, analysts said, that gives an opening to North Korea — and maybe China and Russia — to exploit the gap between Washington and Seoul. First, the U.S. wants proof of Pyongyang’s efforts to denuclearize. The Trump administration, like those of Presidents Barack Obama, George W. Bush and Bill Clinton, is focused on North Korea’s nuclear weapons program above all else. That’s in large part because North Korea has been developing an intercontinental ballistic missile that would give Pyongyang the ability to strike the United States mainland with a nuclear warhead. But the two sides didn’t agree on the definition of denuclearization. For President Trump’s top foreign policy officials — Mike Pompeo, the secretary of state, and John R. Bolton, the national security adviser — denuclearization means North Korea halting and dismantling its nuclear weapons program. Mr. Bolton said last week that North Korea had not taken steps necessary for denuclearization, a process that American officials have said should include turning over a list of Pyongyang’s atomic weapons stockpiles, nuclear production facilities and missiles. North Korea has not agreed to do so and, according to Mr. Pompeo, is still producing fissile material at plants. Separately, American intelligence officials have concluded that North Korea is continuing to make long-range missiles at a site north of Pyongyang, according to news reports. South Korea wants the United States to give Kim Jong-un, the North Korean leader, something significant — ideally an end-of-war declaration — to build domestic political will for denuclearization. For the North Koreans, that means prioritizing an end-of-war declaration and peace treaty, analysts said. Joseph Y. Yun, the former senior diplomat on North Korea at the State Department, said in an interview that Washington and Pyongyang could try for a “declaration-for-declaration” agreement: North Korea would declare its nuclear assets in exchange for the United States’ supporting a declaration to end the Korean War. The two Koreas want a declaration by this fall — way too soon for the U.S.
For the declaration, the two Korean governments are working on a year’s end deadline at the latest, but ideally by the Sept. 18 start of the annual United Nations General Assembly meeting in New York. It is widely believed that United Nations officials might invite Mr. Kim to attend the assembly and deliver a speech. “The best-case scenario is that Kim Jong-un visits the United Nations with a peace declaration in hand,” said John Delury, a professor at Yonsei University in Seoul who writes on the Korean conflict and Chinese history. The Koreas had originally considered putting together an end-of-war declaration in July, but that did not happen. Given their skepticism over North Korea’s commitment to denuclearization, American officials said the timeline was much too fast. As always, the wild card is Mr. Trump. He insisted that the Singapore summit meeting be held in June, even though American officials wanted more time to prepare. Mr. Trump might aim for a similar foreign policy extravaganza in the fall, timed to the United Nations assembly and before the crucial November midterm elections in the United States. American officials worry a peace declaration could dilute the U.S. military in Asia. Although a peace declaration is not the same as a binding peace treaty, it would start the process for one. That would mean talking about how many American troops are needed in South Korea. Before the Singapore meeting, Mr. Trump ordered the Pentagon to prepare options for drawing down the troops there now. World - U.S. Daily News: Why Is the U.S. Wary of a Declaration to End the Korean War?